Are you ready for the ultimate challenge? Kick bikes and Dirt scooters are for adventurous people who love to ride along the nature of Zermatt with speed and fun! 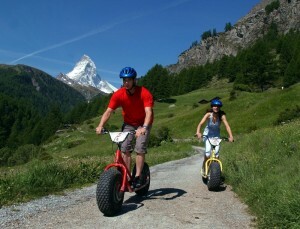 Both Kick bikes and Dirt scooters are one of the fun ways to move around Zermatt either for a thrill or for excitement! 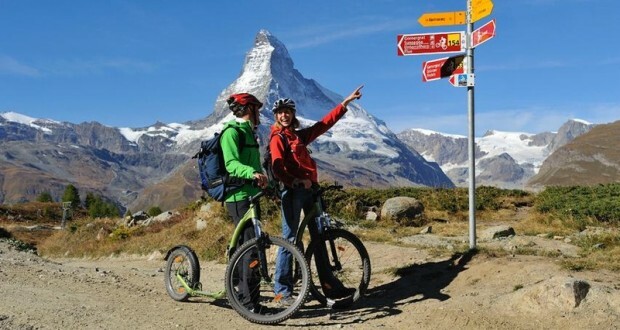 Zermatt has much to offer those who want to explore on two wheels and is a naturally beautiful setting for getting out in the fresh air and seeing what the Alps in summer have to offer. If you haven’t tried Kick bikes or a Dirt scooter then this might be the summer to give it a go! The area in and around Zermatt is fantastic when it comes to exploring – and not only when the ground is covered in powder during the winter months. The summer too offers some fantastic adventures, as well as many more options when the earth is clear of snow and ice – such as setting off on a bike. Whether you’re travelling in a couple, a group or a family, Kick bikes and Dirt scooters are an exciting way to get to know the terrain of this famous Alpine area – and all with the thrilling backdrop of the majestic Matterhorn. You can rent the popular Kick bike scooters, with a helmet included at Sunnegga valley station. After you have everything and ready to go, you can take the route from Tuftern down to Zermatt, which allows you to get up to some fairly significant speeds! You can speed down to Zermatt or have a break at one of the attractive restaurants and enjoy a cool refreshing drink or a delicious icecream before you continue your ride towards Zermatt. After you finished having fun with your Kick bikes, you can returned it at the valley station. If you’de rather go on the Dirt Scooters, you can do that too. Travel up to the Schwarzsee in the cable car to rent the Dirt Scooters. One you’re ready, go for the thrill of your life whooshing down the slope on your Dirt Scooter all the way back down into the valley! Or before speeding away on Dirt Scooter, you can enjoy many things in Schwarzsee since it is a starting point for many different trails. You can look around the crystal clear Schwarzsee with its idylliclly located chapel or fill your stomach at a cozy restaurant before going on a thrilling ride. For both Dirt Scooters and Kick bikes, you can just jump on the Matterhorn Express lift and free wheel down. From Furi is very easy with main roads and little it off road options. It would take about 20 to 30 minutes. From Schwarzsee is a bit more challenging and thrilling with a down dirt road and an option of a steeper trail. Whichever you take it is an ideal programme for a day out with an enormous fun factor! And of course there are plenty of places to stop off along the way for lunch, gourmet, or simple snacks and maybe even a little bit shopping!